I run a hundred miles an hour, to try and get free. But to stained dollars we obey, ease the military away. What happened to making the most of it? The visuals in this music video for Birdpen (by Pooya Abbasian) are, at first glance a bit random and disconnected which, if I’m honest, initially put me off. I was like, what’s this all about bro? But the song itself – with its earnest description of the anxiety-riddled self doubt that chaperones our search for significance – speaks to the indeterminate, ultimate open-ended-ness that flows beneath us as we grow up. In that light, something connected and I watched it a few times in quick succession. Maybe you’ll like it too? Thanks for taking the time to send this in Pooya, cheers! And I want to bear a fruit for you. The process of becoming a person is a strange one; it is messy, inexact and crude. Anyone who tries to convince you that their maturation was as smooth, confident and intentional as an expertly executed golf stroke is lying. We are all tumbling through space, constantly trying on new masks and costumes hoping one eventually feels right. Someone once told me that you don’t know who you are until your late-twenties and, in my case at least, that’s more-or-less true. Up until then we try desperately to make sense of the instincts, fears and desires that were imprinted into our fragile minds at birth or injected sometime after as the result of some inexplicably electric first-hand experience. We want to make our parents happy and then we relish their disapproval. We reject the social caste system but secretly hope we’re cool, forever longing for the approval of our peers. We love and we hate; we brood and we let go; we’re anything but still. The visuals are from Sub Pop’s neighbors at WINTR who, I think you’d agree, knocked it out of the park. The out-there/colorful/abstract/geometric elements soar when tethered to the sweeping, baroque landscapes. The net effect is thrilling, like watching a kite pulled taut by the wind. Full-screen HD, y’all. Grab your headphones, crank the volume and enjoy! Click here for more Sub Pop goodness on The Tripatorium™. One thing’s for sure, one thing’s for sure, one thing’s for sure, we’re all getting older. David Wilson Creative is teeming with talent. Their music videos are consistently top-notch and this one, a trippy, bisected journey through the wormhole of life – from birth to death and then back again – for The Maccabees, is no exception. They also uploaded a super-rad making-of video that’s full of fascinating tidbits – like how it was shot entirely in one day (!!!) – as well as insight into their tools, process and inspiration. This quote, from David himself, shows how intentionally he approached each detail of the execution, “What was really important in terms of the edit…was essentially the percussive nature of the track. There’s lots of really nice accents and I really wanted to accentuate that…so we spent a lot of time finessing and working on the objects pulling apart to really make an impact on both the guitar parts and the drums throughout”. Click here to see more David Wilson Creative work that we’ve posted to the site (Our favorite? Zero hesitation: Let Go) or here to check out their Vimeo account, a treasure trove or rad watchables. Their in-progress Advent series is especially nice. Enjoy! And your body cannot stop rocking. I know…it hurts to let go. This one’s a bit melancholy but, don’t despair, it’s also sweet and poignant so the net outcome skews towards reflection, not sadness. Ari Gibson channels a Miyazaki-esque vibe in this music video for Gotye that does a terrific job of exploring the weird, heady gumbo of new (often times conflicting) emotions and experiences that define our transition to adulthood. What gets lost as we grow up? Can we get it back? The synergy between the visuals and the music is fantastic so make sure HD (available in both 720 and 1080p) is selected and the headphones are on. Enjoy! Oh, and Ari also directed The Cat Piano, an excellent short film we posted back in June so I’d recommend giving that a watch next. ‘Old Fangs’ is a short film directed by Adrien Merigeau and Alan Holly that was produced at Cartoon Saloon in Kilkenny, Ireland. It has won a slew of awards and, after watching it, you’ll understand why. Lots of heavy themes here – kind of reminds me of Gauguin’s Where Do We Come From? What Are We? Where Are We Going?. Mark, I am your fellow actor. It feels very strange having the fourth-wall shattered on such an iconic image from your childhood. 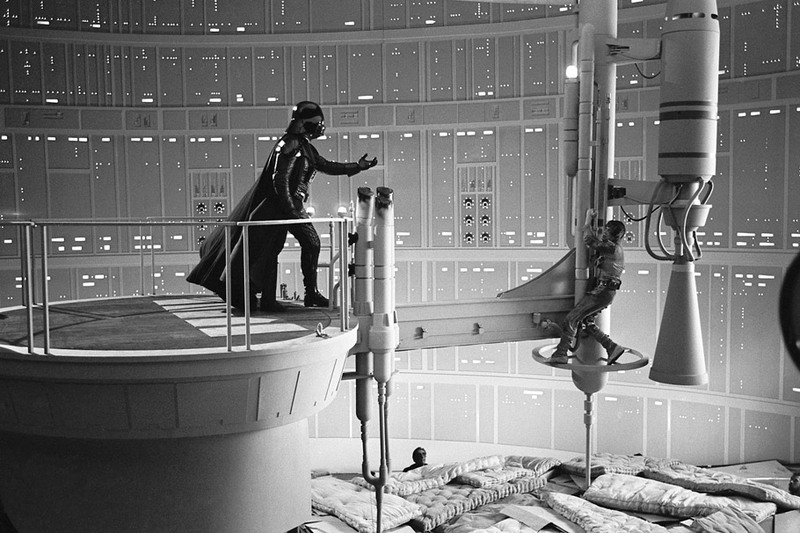 See eleven more excellent behind-the-scenes photos from the filming of The Empire Strikes Back over at Vanity Fair.